Viking Landers Smith slips past the Warriors' defense. Warrior Lane Johnson and Viking Garett Vaughan battle for the ball. 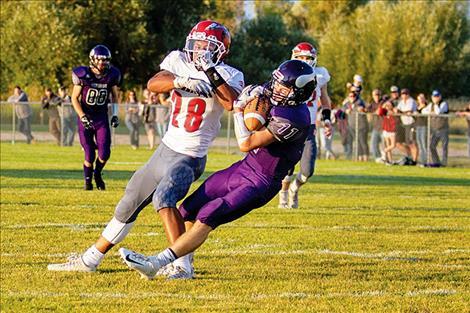 CHARLO – “Touchdown Landers Smith,” was sweet music to any Viking football fan and a nightmare for the Warriors during the Friday evening game in Charlo. 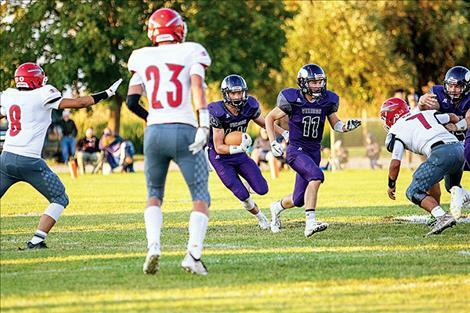 Smith, the senior quarterback, was associated in one way or another with all five Charlo touchdowns as the Vikings rolled to a 36-16 victory in their home opener. Smith scored in the first quarter with a 39-yard touchdown run. 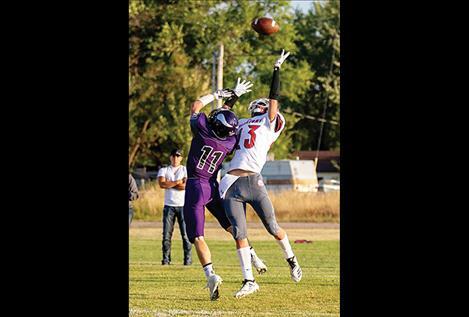 The Vikings took a 14-0 lead after Smith hit Bridger Foust for a 11-yard touchdown pass. In the second quarter, the Warrior put points on the board when Lane Johnson hauled in a 23-yard touchdown pass from senior quarterback Lane Schall. The Vikings kept pace as Smith once again connected with Foust for a six-yard touchdown pass. The Warriors narrowed the margin to a one possession game on a nine-yard touchdown run to close out the second quarter. Vikings led 22-16 at halftime. 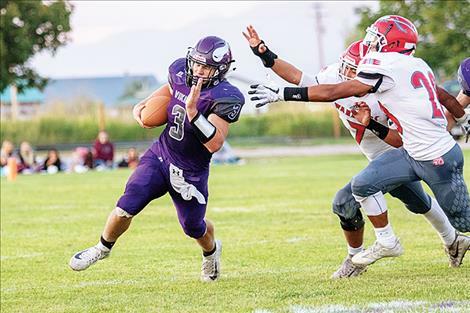 “Our team played extremely hard against a very physical Arlee team,” said Charlo Viking head coach Mike Krahn. Smith and the Vikings scored twice in the second half: once in the third quarter, on a Smith to Roper Edwards eight-yard touchdown pass, and again in the fourth quarter, as Smith bulled his way 10-yards into the end zone through Warrior defenders. The Vikings defense and special teams put on a solid performance in the second half. The Warriors had opportunities to keep it a closer game when they reached Viking territory, but they couldn’t get a touchdown through the smothering Viking defense. Smith packed the ball 26 times for 243 rushing yards and two touchdowns, spearheading a Viking offense that tallied 324 yards on the ground. Through the air, Smith hit 7 of 15 passes for 54 yards and three touchdowns. For the Warriors, Schall was 14 of 32 passing for 183 yards and one touchdown. He also rushed 47 yards and a touchdown. Wide receiver Johnson grabbed seven catches for 133 yards and a touchdown. The Warriors, now 1-1, will return home to face Seeley-Swan on Friday at 7 p.m.